Building around 300 homes a year, and providing services to over 23,000 people in 11,000 homes, Knightstone is a leading housing association operating throughout Somerset and the west of England. 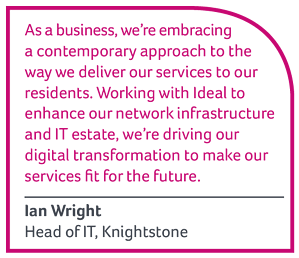 The organisation is committed to an ambitious five-year business plan, through which it is aiming to transform the way it works and engages with its customers, with the goal of becoming leaner, more effective, and delivering value-for-money services without waste. By 2021, Knightstone aims to have transformed its business by redesigning its services for digital end-to-end delivery, ensuring that its culture, systems, processes and approach enable it to thrive in a new housing era. 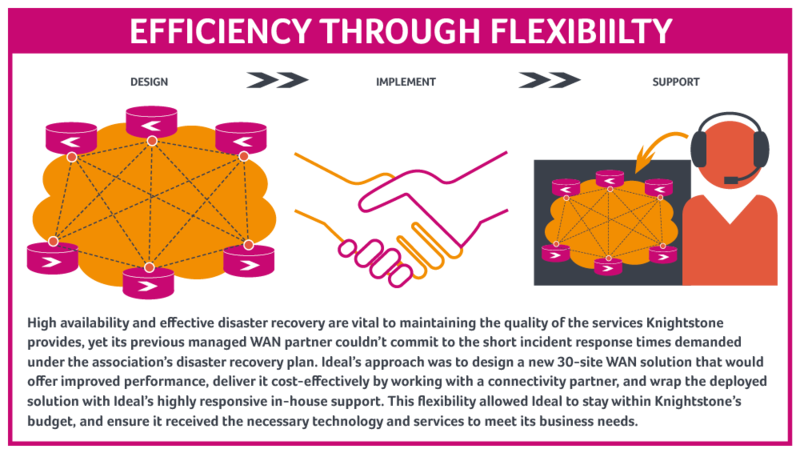 The plan commits it to becoming more agile, and to embracing digital transformation: core to both will be an effective IT estate that offers high availability with the maximum return on investment. Knightstone’s IT estate spans a wide range of architectures and vendors, including security, network infrastructure and data centre solutions from Cisco, Palo Alto Networks and NetApp. Ideal’s initial engagement, in 2015, was to supply, configure and provide support for perimeter firewall appliances. In 2016, Knightstone invited submissions for delivery of a WAN refresh programme. At the same time, to achieve the efficiencies demanded by its business plan, it was seeking to streamline its support providers and consolidate its disparate IT supply base. Ideal won the WAN tender, and entered into a new phase of its relationship with Knightstone - acting as a strategic partner to provide consultancy, advice and solutions across multiple vendors and competencies. Working as Knightstone’s trusted technology partner, Ideal has consulted, advised and delivered on projects spanning security, storage, network infrastructure, and licensing reviews and renewals. Conscious of the budgetary constraints faced by housing associations, and of the business’ aim to greatly reduce its operating costs, Ideal takes a highly flexible approach to design and delivery, leveraging the capabilities of partners to ensure the organisation receives the right technology at an acceptable cost. Ideal is a Cisco Premier Partner with multiple architecture specialisations spanning the breadth of the Cisco portfolio. With a track record in highquality, in-house support and a proud history of excellent customer service, it combines the expertise and reassurance of a large partner with the flexibility of a smaller supplier. Great customer relationships are fundamental to Ideal. From initial discussions, through sales, design and delivery, Ideal’s staff are empowered and encouraged to find new ways to achieve the optimum result. 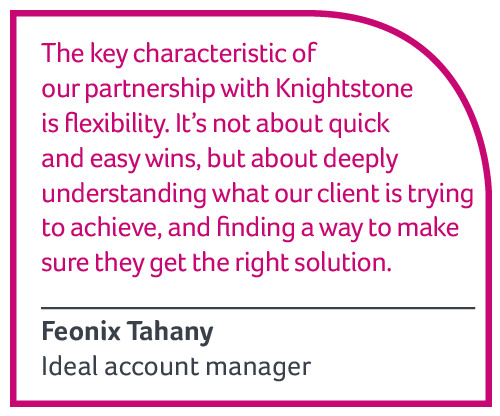 This ‘think customer’ approach means understanding clients’ business needs and drivers, and finding technology solutions to meet them: an Ideal basis on which to satisfy Knightstone’s objectives. Need a technology partner to help manage your estate? Talk to us about your network challenges or managed services needs: contact the Ideal sales team on 01273 957500, or get in touch online.